A lot of braised short rib recipes take hours to prepare because the cut requires a slow cook to bring out the flavor and texture that it's known for. 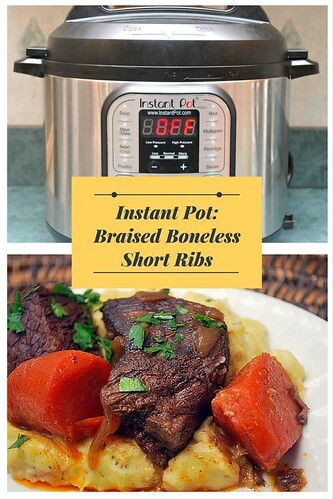 This recipe, however, allows you to get all that flavor and texture and save time as well using the Instant Pot. The boneless ribs are browned and then pressure cooked in a combination of red wine (preferably Cabernet Sauvignon) and a little beef broth. Aromatics such as bay leaf, fresh sprigs of thyme, garlic and onions also add to the deep flavor these ribs have. After the ribs have pressure cooked, the liquid is reduced and thickened with gelatin for a silky texture. 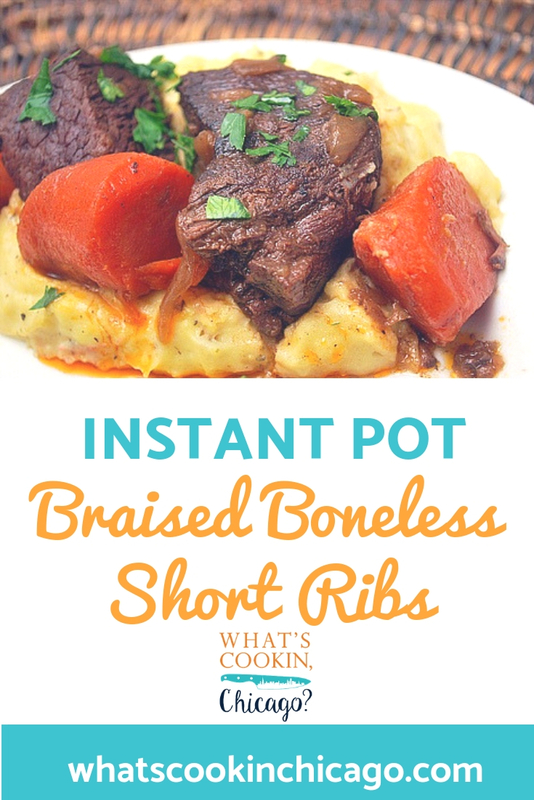 I served this over buttery mashed potatoes for a truly comforting meal. Pat beef dry with paper towels. Stir together salt and pepper and sprinkle over beef. Press SAUTE and add 1 tablespoon oil. Add half of beef and cook without moving, 4-6 minutes, until well browned. Turn beef over and cook second side until well browned, another 4-6 minutes. If fat begins to smoke, reduce heat. Transfer beef to medium bowl. Repeat with remaining oil and beef. In the now empty IP, add onion, and cook, stirring often, until softened and barely browned, 12-15 minutes. (If onions darken too quickly, add 1-2 tbsp water to pot.). Add tomato paste and stir constantly until it browns on sides and bottom of pan, about 2 minutes. Add garlic and cook until fragrant, 30-60 seconds. Add wine, and simmer, scraping up fond from sides and bottom. Add beef broth, carrots, thyme, and bay leaf. 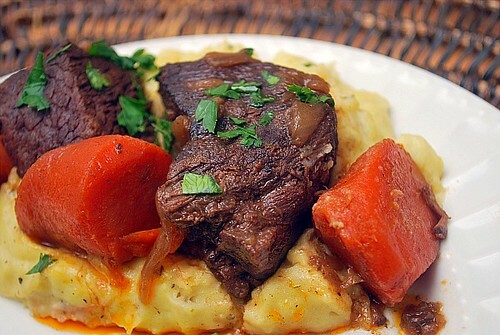 Add beef and any juices in the bowl. Cover and bring to a simmer. When done, a fork will slip easily in and out of meat. Using tongs, transfer meat and carrots to serving platter; tent with foil. Place water in a small bowl and sprinkle with gelatin. Let stand 5 minutes. Strain cooking liquid through a fine strainer into a fat separator. Press on solids to extract as much liquid as possible, then discard solids. Allow to settle, then strain off fat. Press OFF and stir in bloomed gelatin; season with salt and pepper to taste. Pour sauce over meat and serve.